According to entrepreneur Tim Ferris, in his book The 4-Hour Workweek: Escape 9-5, Live Anywhere, and Join the New Rich, the key to success is to eliminate that which produce problems and automate tasks using technology wherever possible. In the eCommerce world, one of the biggest challenges for sellers is that multi-channel retail is fragmented and highly disjointed. From inventory management, order management, and customer support, to the logistical challenges that come with marketing, business growth and scaling, there are a lot of moving parts that comprise an eCommerce operation. So, the big question is, how can you put these complex and diverse processes on autopilot? How to manage all retail operations at once without hiring an army of employees or using a plethora of software tools? With a centralized eCommerce management solution, that’s how. However, most online retailers simply forgo this imperative element of their business and leave themselves vulnerable to several consequences. Why Do Online Stores Struggle to Find a Footing? While there’s a low barrier to entry when it comes to starting an eCommerce business, sustaining it successfully is a challenge that most companies fail to overcome. In fact, according to Business 2 Community, 8 out of 10 online stores fail within the first 24 months; a discouraging statistic, considering the fact that eCommerce is one of the fastest growing markets at 13-14% growth per year. Online retailers often neglect or refuse to invest more than the nominal budget in their online store. Any business, online or otherwise, needs significant investment capital to successfully get off the ground. Inventory control management is a crucial facet of online store management. Businesses often fail to find that balance between too much inventory and not enough inventory. The former leads to poor cash-flow and low ROI; while the latter can result in poor sales and unsatisfactory customer relationships. According to a recent survey, 43 percent of small businesses fail to properly handle inventory management while 21 percent use ad-hoc systems and spreadsheets to keep track of data. Many retailers often make the costly mistake of not knowing who they’re selling to. In failing to do so, they end up targeting an audience that is not qualified or interested in their products. Marketers need to invest in the requisite research and tactics required to narrow down the audience to become more qualified, and thereby, increase sales. There is a wide variety of tools and systems that businesses use to run their ecommerce business. However, using separate systems to manage various operations associated with the business - such as website management, order and inventory management, product listing management and others - is not as efficient as having a centralized ecommerce solution. Integrating multiple systems can result in disparities between the data from these systems. As the company scales, so will the volume of data that will need to be handled by these systems. Since, each of these systems will have their own data structures and formats, integrating and synchronizing these systems can be daunting and result in loss of data integrity and consistency. It can also cause a disconnect and loss of transparency between the various teams handling the various aspects of the business. The running of an eCommerce business is composed of thousands of tasks that, when taken on their own, may seem small, but, on the whole, eat into a business’ productivity and efficiency. All of these factors, in combination, can be a serious obstruction to a business’ ability to scale. Even to the point, as the customer demand grows, the complexity of the tasks will become impossible to handle using multiple platforms and systems at once. 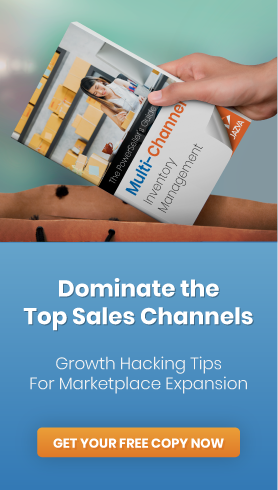 Businesses that are looking to improve and scale their operations usually do so across multiple eCommerce platforms, such as Amazon, Walmart and eBay, along with their own website. They will, therefore, need a simplified way to export and manage their product listings across all these channels. Easily uploading, syncing and managing bulk product listings through one single dashboard, eliminating the need for them to manually upload listings on each individual channel. Deriving valuable insights of the sales performances across all channels through one single dashboard. Providing real-time visibility of their inventory and stock levels across all channels from one unified dashboard. Updating and managing inventory based on sales, returns, refunds and bulk-orders. Triggering automatic stock re-ordering and purchase orders when the inventory runs low or based on projected inventory stock levels based on sales history. Track and manage orders across all channels from one single dashboard. Manage retail and wholesale orders, refunds, returns and exchanges with minimal turnaround time. Prioritize and process bulk orders and dispatch shipments efficiently and accurately. Automatically selecting the best shipping methods based on the shipping rates, parcel size and weight. Allowing warehouse teams to generate and print shipping labels, pick lists and packing slips for received orders. Tracking complete and partial shipments from the time they leave warehouse till they reach their customers. Retailers note, per a recent Software Advice report, that the biggest roadblock to shipping (35%) is managing incoming orders. And with today’s global consumers being widely mobile, there’s a need for retailers and wholesalers to quickly adapt to their changing behaviors of their consumers. Today, more than 70% of online shoppers make their purchases on mobile devices, as opposed to PCs and desktops. As such, the demand for immediate and seamless order-fulfillments is on the rise. Likewise, according to a survey done by Accenture, a growing percentage of consumers prefer their orders fulfilled within 2-5 days of their purchase. Additionally, there is a growing preference for businesses which offered same-day or next-day deliveries from retail stores. In sum, today’s consumers are looking for more value, convenience and a better customer experience. Putting the consumer landscape in the perspective of the growing eCommerce business, it is clear that businesses need to seamlessly adapt to the growing demands of their consumers by minimizing any gaps in their operations. Given the givens, then, it’s easy to see how automating and centralizing eCommerce operations to a single unified platform can help businesses easily adapt to the fickle nature of today’s consumer landscape and improve customer loyalty. Attempting to implement manual or disparate operational systems within this context would, in fact, be next to impossible. The quick turnarounds and seamlessness that is a requisite in today’s shopping experiences can only be achieved through an all-in-one system. Analytic platforms like HubSpot or Kissmetrics to gain insights into customer behaviors, identify under-performing features or pages that are increasing bounce rates, and then, optimize their marketing efforts to convert more visitors into consumers. SEO Analytic platforms like Google Analytics or Moz to explore and identify a business website’s SEO strengths and weaknesses, and use those insights to improve their rankings, keywords, and content to improve website traffic. A/B testing tools like Unbounce to help test and create optimized pages to encourage visitors to engage further with the website instead of clicking away. Given the high failure rate of running an eCommerce business and the fickle nature of today’s consumer market, business owners need to be constantly on the lookout for potential pitfalls. One of the major pitfalls, unsurprisingly, is complacency. A spike or upturn in sales rates can only last so long before customers’ needs are taking a different turn, leaving businesses struggling to catch up with them. Therefore, eCommerce business owners need to be able to constantly adapt their operations to provide seamless, unchanged shopping experiences for their consumers. Even established businesses with long success runs stay that way because of their ability to mold themselves around the changing landscape of the market. And as we’ve seen thus far, automated, centralized and unified retail optimization software systems are the first step towards long-term eCommerce success.